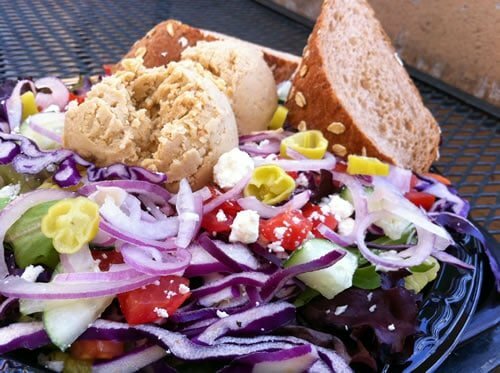 A satisfying Togo's Farmer's Market Salad with Feta, Hummus, and tons of delicious veggies. Togo’s is a sandwich chain with about 240 locations on the West Coast (mostly California), similar to Quiznos and Subway. Unfortunately, as with nearly every other restaurant, they’re heart-stoppingly-high in sodium. Even so, there are definitely ways to mitigate that — and find a healthful, delicious, and affordable lunch. Because of the high sodium and low fiber in their breads, I recommend getting a salad instead of a sandwich. Pictured above is a recent lunch I had at Togo’s — I got the Farmer’s Market Salad (which had a ton of crisp, fresh veggies, including red cabbage, cucumbers, and tomatoes), and I spruced it up with some feta crumbles and a couple of scoops of hummus. I got the Fat Free Grape Vinaigrette on the side, but ended up barely touching it — the salad had plenty of flavor on its own! This was a large, filling, delicious salad — and a relatively healthy choice overall. If you really want a sandwich, a good compromise is their “Pick Two,” in which you can choose two options from a half-sandwich, half-salad, and a cup of soup. Careful, though: A “half sandwich” is not half of a 6″ Regular sandwich — it’s really a 4″ sandwich. So the nutrition numbers will be around 2/3 of a regular, not half! You can also get a kid’s-size 3″ sandwich, which is actually half of a regular sandwich. I can’t stress enough on the salads (and salad wraps) how much of a difference the dressing makes — you can easily double or triple the calories (and fat, and sodium) in your lunch, without it even tasting all that much better. This is one of those times that a small sacrifice in taste (if any) can pay huge dividends in your health. Numbers are for Full Salads, WITHOUT DRESSING. I’m only able to make one recommendation here. The others are either very high in calories, sodium, or both. All are 2.5 ounce servings, unless noted. This is obviously intended for the Taco Salad, which is by far the worst salad (sans dressing) on the menu. Togo’s will turn any salad into a wrap, and they even have three tortilla options (I’ll list those separately). These numbers include a whole wheat wrap and the specific dressing. The best option would actually be to get the Farmer’s Market wrap with the Fat-Free Serano Grape Vinaigrette (instead of the Balsamic Vinaigrette) — which would bring the sodium down to a reasonable level. By the numbers, almost any wrap will be better for you than any regular-size sandwich (with maybe the exception of the Avocado & Cucumber Sandwich). Again, these are still better than most of the sandwiches — even if they might have more calories, they have less sodium and more fiber. The wraps are almost identical for all the numbers — except for fiber. That’s a good indicator that the whole wheat tortillas most likely use at least some whole wheat. Don’t be fooled into thinking these are healthy because they might contain a tiny bit of spinach or sun-dried tomatoes. They use a huge amount of sodium in their breads. Half-a-day’s worth of sodium (or a full day’s worth if you’ve already got high blood pressure) is the best you could ever hope to do with a regular-size sandwich from Togo’s. The “Best” Choices are all under 2,000mg sodium, and are listed in order of increasing sodium content. Sigh. Compared to other restaurants, their tuna is remarkably low in fat. If you do nothing else, please promise me you’ll avoid the Salami. I’ve listed the sandwiches in order of decreasing sodium content, just to illustrate my point. Are you kidding me? Not a typo: That’s three days’ worth of salt in one sandwich. Every single hot sandwich has over 2,000mg sodium. A bit high in the saturated fat, but lower than most others in the sodium. Lower in calories, but still too high in sodium. Considering that they all have at least 95mg of sodium per inch, you can see how it adds up quickly. A 6″ sandwich would give you 120mg more sodium — then again, you’d also get more fiber. Tough call. On a 6″ sandwich, that would give you an extra 60 calories and 240mg sodium compared to the Classic White or Onion Herb. thank goodness the egg salad sandwich is on the ok list – that is my favorite Togo’s sandwich, although it has been a long time since I have visited. Togo’s was close to my house growing up, but there do not seem to be quite as many anymore…. Yup, Egg Salad is on the “ok” list (relatively speaking). I still can’t believe how much sodium is in ALL of their offerings, though. Sadly, too, it’s probably also safe to assume that they don’t source their eggs from any cage-free or organic farms — considering that neither health nor sustainability are not mentioned anywhere on their website (not even a little bit of lip service! ), I doubt animal welfare is high on their list, either. Sigh. I think the key you hit on is the hidden sodium in the breads (and even the lunch meats). I don’t get to Togo’s often, but find the BBQ Chicken Ranch salad to be a tasty and filling option, dressing on the side. Good write-up Andrew! It seems like they changed their menu slightly and now the balsamic is low fat. The only non-fat dressing they have is honey mustard, which sounds kind of gross. Anyway, I had the farmer’s market salad with balsamic in a whole wheat wrap and it was absolutely delicious!!! Thanks for doing the analysis for me! (And yes, I’m no longer following the rules, but I am trying to make better choices). Thanks for this guide, Andrew! I used it today to pick a “half” sandwich of avocado and cucumber. I also went with the garden vegetable soup.